They're tone deaf. The issue of domestic violence is so serious. You could assault somebody and the NFL will let you in. Reporter: A new national outcry ricochetting over the Washington Redskins' decision to sign linebacker Reuben foster after he was cut by the 49ers. We decided to make the move, and we'll deal with the outcry. 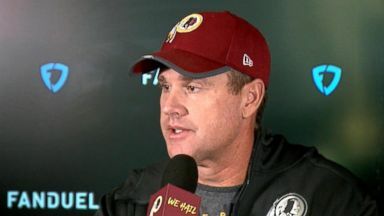 The Washington franchise was the only NFL team interested in foster, and now their controversial move has the team's head coach, Jay Gruden, playing defense. We want to let the process play out and see what happens and get to the bottom of it and, you know, there's no guarantee he's ever going to play here. Basically what you're doing here, you're taking a high risk chance. Washington super bowl winning former quarterback and now senior vice president Doug Williams saying in a radio interview today the Redskins front office was united in their decision. The high risk was the beatdown, the beat-up we're going to take from a pr. We are hoping that things come out and it wasn't the way that everything has been perceived. We don't know that. Reporter: On Tuesday, Williams said in a statement, the Redskins fully understand the severity of the recent allegations made against Reuben. If true, you can be sure these allegations are nothing our organization would ever condone. But Washington's choice to even consider a player under such a cloud of suspicion is leading many to question whether this team and the NFL as a whole have learned their lesson when it comes to dealing with allegations of domestic violence. Dallas cowboys star Greg hardy. Football star Jameis Winston. Another crushing blow for the NFL. Reporter: The latest allegations against this 24-year-old came last Saturday night with a 911 call from a Tampa hotel room. The ex-boyfriend is what? Took my phone and broke it and slapped me in my face. Reporter: That's the voice of Reuben foster's ex-girlfriend. Charge of battery and domestic violence. 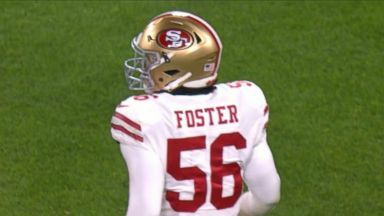 Foster, a first round draft pick and a star on the field was dropped by the 49ers the following morning, only to be picked up by Washington three days after his arrest. He's a guy who can definitely be a difference maker for a team. Reporter: This was not foster's first run in with the law. In April, he was charged with felonies for domestic violence, making criminal threats, and weapons possession after being accused of beating up ennis. She later recan'ted her accusations, claiming she made the story up as revenge for foster breaking up with her. This week, the NFL placed foster on the NFL's exempt list, making him ineligible to play until it's concluded its own investigation. The NFL actually did the right thing. I think makes Washington's decision to bring him in look even more alarming. Reporter: Foster is the latest in a long line of NFL players accused of domestic violence, the most notorious, ray rice of the Baltimore ravens. This 2014 video obtained by "TMZ sports" showed rice dragging his then fiancee's limp body out of an elevator. He was indicted on aggravated assault charges. The very next day, he and palmer married. I failed miserably, but I wouldn't call myself a failure. Because I'm working my way back up. Reporter: The NFL initially gave rice what many considered a slap on the wrist a two-game suspension. Then later, a second video emerged, also obtained by "TMZ sports," showing rice punching palmer in the face in the video. The NFL suspended him indefinitely. Rice appealed and was reinstated, although he has yet to be signed by any NFL team. I got it wrong in the handling of the ray rice matter. And I'm sorry for that. Reporter: Rice entered an intervention program for first-time offenders and his charges were dismissed at completion, but the case sparked a national outcry and ushered in sweeping changes to the NFL's policy, including independent investigative powers and a minimum six game suspension for first time domestic violence offenders. The charge of battery and domestic violence. Reporter: As for Reuben foster, his signing is the latest in a string of controversial personnel decisions by Washington. In 2015, the club signed defensive player junior after he was released by the New Orleans saints for a domestic violence arrest. Though the charges were later dropped, he served a two-game suspension. The team's current starting running back, Adrian Peterson, served a six-month suspension for child abuse while playing for the Minnesota vikings. Just last week revealing in an interview with bleacher report that he still physically disciplines his children and that he didn't let the suspension change his ways. You've got junior, Adrian Peterson, and now you've got Reuben foster. And this is not a coincidence. This is something that this team obviously is encouraging. It is fostering and it wants to be a participant in signing people of questionable character. Reporter: All of this as the team's front office made another decision many found curious. More than a week ago, the Redskins starting quarterback went down for the season, forcing the team, hungry for a playoff berth, to sign a back-up. Washington's quarterback, Alex Smith, broke his leg and Washington needed a replacement. So they have colt Mccoy, and then they brought in the former jets quarterback, mark Sanchez. Reporter: Sanchez, who hadn't played in two years, was signed over free agent quarterback Colin Kaepernick who made national headlines for kneeling during the national anthem to protest racial injustice. To take a knee during the national anthem and you can't find a job. Kaepernick looks better and better every single day. Since Colin Kaepernick last took a snap in an NFL game at the end of the 2016 season, teams have signed players who can barely walk and chew gum, who can't throw the ball from point a to point B accurately, and they signed them and they've passed on Kaepernick, who no matter what you think of him, has shown that he can do things on a football field. We don't have to extrapolate here very much to say that Washington has decided it is better to allegedly hit a woman than it is to kneel in protest about social injustice during the national anthem. Reporter: The team and owner Dan Snyder are no strangers to controversy. For decades, there's been public outcry to change the team's name, which critics say is a racial slur against native Americans. Snider has said he is never changing the name. He's been painted as a villain in many situations over the years and it doesn't seem to bother him at all. This situation that we're dealing with now with Reuben foster would not have occurred if Dan Snyder had not checked off on it. Reporter: The arraignment for foster's charges is scheduled for January 3rd and for now, foster's fate remains uncertain as well as the stature of this once revered NFL franchise. I covered it in the '80s when they won super bowls. Be a distant memory to this organization now that would be willing to roll the dice on a man who has been accused now twice of domestic violence as recently as 72 hours before they signed him.